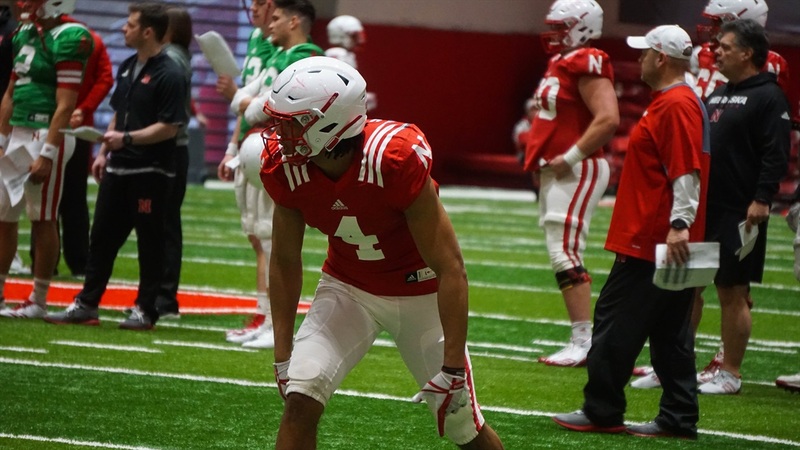 Saturday’s spring game is a big event for the fans desperate to get a first look at the new-look Huskers under Coach Scott Frost. However, for one player, it means just a little bit more. Redshirt freshman wide receiver Jaevon McQuitty is set to suit up for the Huskers for the first time on Saturday. The 6-foot wideout from Columbia, Missouri, who graduated high school early and enrolled at Nebraska last spring, was held out of contact in the spring with a shoulder injury then suffered a knee injury during fall camp that knocked him out for the season. Now, back to full health, McQuitty is ready to get back on the field. McQuitty looked to be on track to see the field as a true freshman prior to his injury. Now he feels as good as he ever has. What is McQuitty most looking forward to doing once he steps on the field come Saturday? Offensive coordinator Troy Walters believes in the “no block, no rock” philosophy, and it seems as if McQuitty has fully bought into that mantra. In fact, McQuitty brought that mentality with him to Lincoln. He credited his high school coaches with instilling the blocking mindset in him because of how much they focused on and practiced it. McQuitty said the coaches have a chart to keep track of how well the players block. He couldn’t remember off the top of his heard exactly where he ranked, but he does have five or six plus-2s (driving a defender back 2 or more yards) and at least a couple pancakes. Physicality has always been the key to McQuitty’s game. He bullied defensive backs all through high school, winning jump balls and contested catches at a high rate. Now, he’s looking to add a little “finesse” to his game. “Now that I’ve got to college, I have to learn how to just be more finesse, more like a Stefon Diggs type of guy … Just crafting my routes and crafting how I get off the ball,” McQuitty said. McQuitty said he watches highlights of Diggs, the former Maryland Terrapin and current Minnesota Viking, “almost every day.” He’s a fan of Diggs’ ability to get in and out of his breaks and how deceptive his routes are. Diggs has totaled more than 1,700 yards while catching over 70 percent of his targets over the past two seasons. A receiver looking to round out his skill set couldn’t ask for a better teacher than Walters, though McQuitty didn’t realize that at first. “I just thought, ‘oh, some coach, you know?’ And then he told us the first day all about him and I said ‘Aw yeah, I’m kind of excited to learn from him,’” McQuitty said. Frost was complimentary of the progress McQuitty has made on Thursday. Fans will get a chance to see that development in person on Saturday. Kickoff for the spring game is set for 11 a.m.